Asia’s richest man has embraced a new faith. Li Ka-shing is splitting his empire in two, separating his property assets which are mostly in Hong Kong and China from the rest of the global ports-to-telecom-to-retail conglomerate. The rejig should help to shrink the group’s persistent stock market discount, allowing Li to leverage up the real estate business, and pay higher dividends. It’s a long-overdue acknowledgement that there is value to unlock. Shareholders in Cheung Kong – Li’s $37 billion holding company – will swap their shares for a new vehicle registered in the Cayman Islands. It will then absorb its 50 percent subsidiary Hutchison Whampoa. The combined group will spin off its property assets, which will be loaded with an additional $7.1 billion of debt. Relocating to the Cayman Islands gives both companies greater flexibility to distribute cash to shareholders. Li reckons that removing a tier from Cheung Kong’s cascading structure of interlocking subsidiaries will release value. At its closing price on Jan. 9 – before the plan was announced – the company’s market capitalisation was 24 percent below last June’s book value. The simpler structure brings external shareholders into line with the Li family, which has enjoyed the best returns in recent years. Conspiracy theorists will interpret the restructuring as a move away from the group’s roots in Hong Kong real estate, and lack of confidence in the former colony. Yet Li is hardly selling up. He will remain chairman of both companies, with his son Victor as his deputy, and the family will own 30 percent of each business. Nevertheless, Li’s belated conversion to shareholder dogma is still a surprise. In more than four decades at the helm of a listed company, the 86-year-old tycoon has shown more interest in keeping a grip on his empire than in maximising its stock market value. He could go further. After the reshuffle, CKH Holding will still own stakes in everything from Singapore-listed Hutchison Port Holdings to Toronto-listed Husky Energy. If Li is serious about unlocking value, there will be further reshuffles to come. 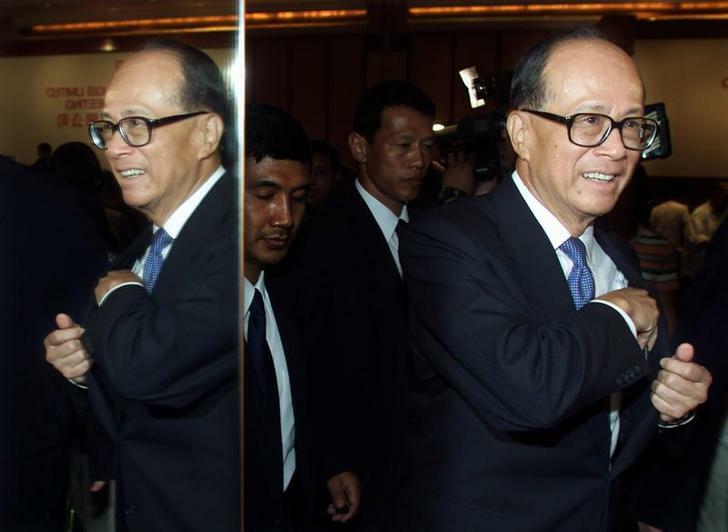 Hong Kong property tycoon Li Ka-shing walks out of a conference room. Cheung Kong Holdings on Jan. 9 announced a shake-up that will split the Hong Kong conglomerate controlled by Li Ka-shing, Asia’s richest man, into two new listed entities. The reorganisation will create CKH Holdings, which will hold all the group’s non-property assets, and a new listed company called CK Property. The move is designed to reduce the conglomerate discount that has afflicted the tycoon’s complex holding company structure, and enable it to leverage up its property businesses. Shareholders in the tycoon’s existing holding company, Cheung Kong, will receive one new share in CKH Holdings, which is incorporated in the Cayman Islands, for each share they already own. CKH Holdings will then absorb its listed subsidiary Hutchison Whampoa. Each share in Hutchison will be exchanged for 0.684 shares in CKH Holdings. A unit of Hutchison will also acquire a further 6.24 percent stake in Husky Energy from the Li family trust in exchange for new shares, thereby increasing the company’s stake in the Canadian energy company to around 40 percent. The newly enlarged CKH Holdings will then transfer all the property assets into an entity called CK Property which it will spin off. Shareholders in CKH Holdings will receive one share in CK Property for each share they own in CKH Holdings. Before the spinoff, CK Property will borrow HK$55 billion ($7.1 billion) which it will transfer to CKH Holdings. Li will be chairman of both companies, while his son Victor will be deputy chairman. The deal is subject to shareholder approvals.